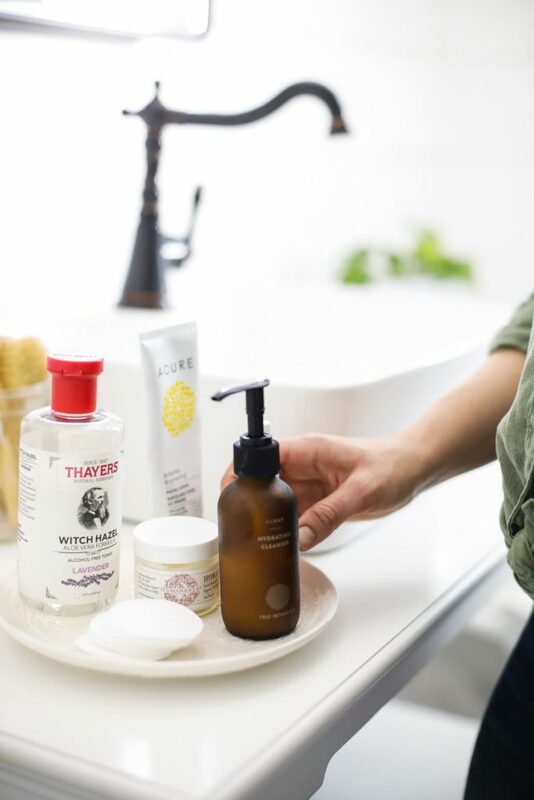 A few years ago, most of my skincare products were homemade, because it was hard to find clean products that didn’t cost a fortune. Today, most of my skincare routine consists of store-bought products. I welcome this shift. This means that I now have more time to do other things, like make homemade meals or spend time with my family. Minutes add up! Now, I can walk into Target (just one example) and find some incredible skincare options. Target! A store that once sold only toxic skincare products now proudly sells brands like W3LL People (lovely makeup), Meow Meow Tweet (natural deodorant), S.W. Basics, and Acure (fantastic products, ranging from facial products to shampoo). With that said, I still love dabbling with homemade products and sharing them on the blog. 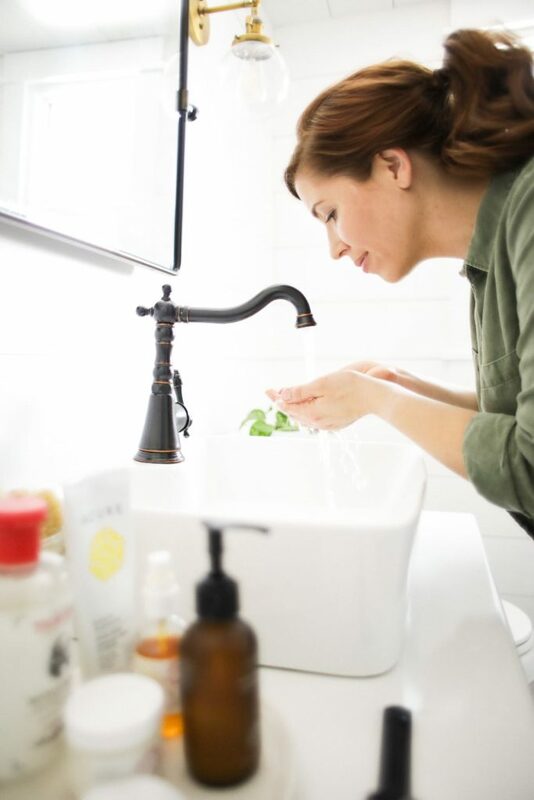 Knowing how to make something, along with knowing how to purchase clean products is a gift. A gift that empowers the consumer (that’s you and me). A gift that I feel strongly about sharing here on Live Simply. If you’d like to take the homemade route with skincare (which can be more budget-friendly), I recommend downloading my body care book. I poured all my knowledge into this resource–thanks to experimenting on my own skin, receiving feedback from reader friends, and exploring research. 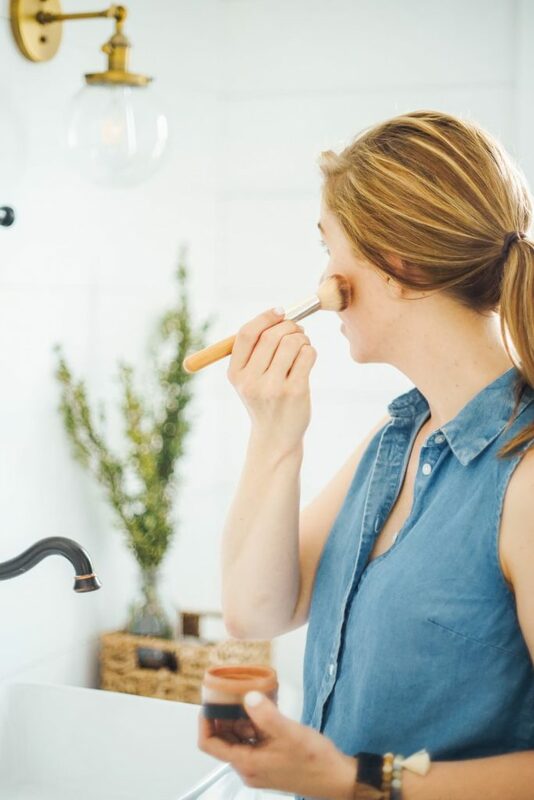 If you want to go the store-bought route (which can be more of a time-saver), know that there are amazing products out there that make this 100% possible. You don’t have to use toxic skincare products. In my book, I created lists detailing my favorite products, from shampoo and toothpaste to makeup and cleansers. It’s all in there. I’ve also been sharing a monthly series on the blog called, Switching to Natural Products. 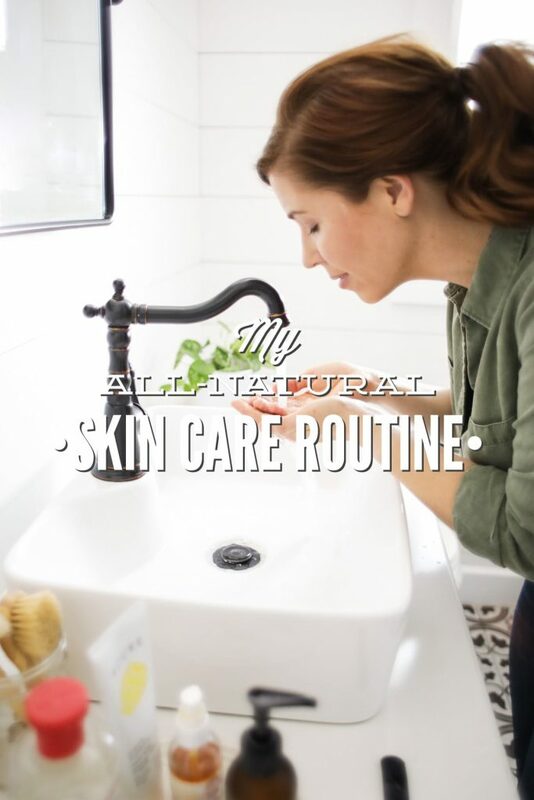 In this series, I share my favorite natural products (homemade and store-bought). So far we’ve talked about deodorant, toothpaste, dish and dishwasher soap, all-purpose cleaner spray. Along with sharing my picks, reader friends also chime in with product suggestions. I love that! 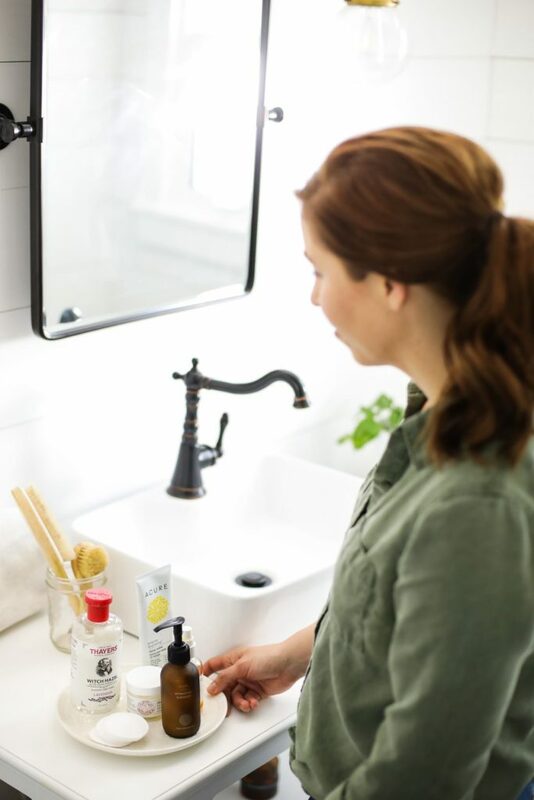 Will you step inside my bathroom and let me show you what I’m currently using on my skin? After I share, I would love to hear about your skincare routine via the comment section below this post. I have three favorite store-bought cleansers right now. Each one varies in price and accessibility. 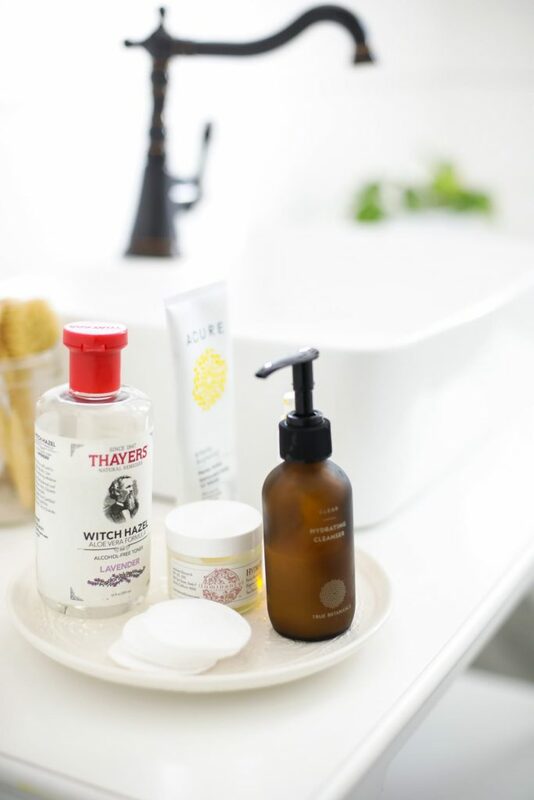 It’s not uncommon to find me switching between these cleansers, because I truly enjoy each of them. True Botanicals Clear Hydrating Cleanser: This one is expensive, along with every True Botanicals product. But the True Botanicals line is simply amazing. I love the gentleness of this product and the consistency (a cream-like cleanser). The only thing that keeps me from using this cleanser consistently is the price. Luminance Skincare Delicate Facial Cleanser: This one is a soap-based cleaner. It reminds me a lot of my homemade basic face wash recipe. I love Luminance Skincare, and their products have all worked very well on my skin. Evanhealy Blue Lavender Cleansing Milk: I just recently purchased this product after looking for a cleanser at Whole Foods. I have tried a number of cleansers from retail stores, and just haven’t found anything I love. This product is different. 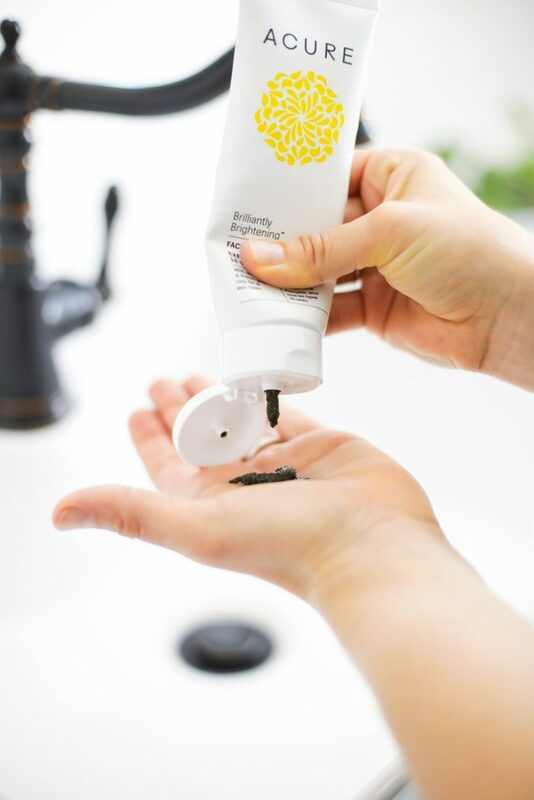 It reminds me a lot of the True Botanicals Cleanser (a creamy consistency and gentle feel on the skin). This is what I’m currently using and absolutely loving! Cleansers don’t fully remove makeup, so if I’m wearing full-coverage makeup I use a makeup remover before cleaning. I go between two makeup removers: 100% oil (usually olive oil) or these makeup remover pads. If you’ve been around Live Simply, you know that I’ve experimented with a number of different toner options. A toner helps to balance the pH of the skin after cleansing. I love rose water and (non-alcohol based) witch hazel. 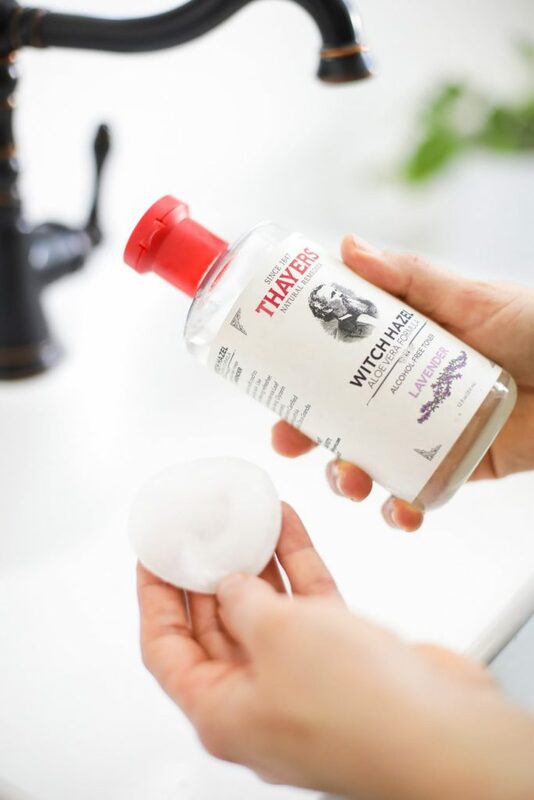 Quality rose water is expensive, so to cut back on my skincare expenses I’ve been using witch hazel (Thayer’s brand) as a toner. My favorite moisturizer is from Luminance Skincare, Hydration. 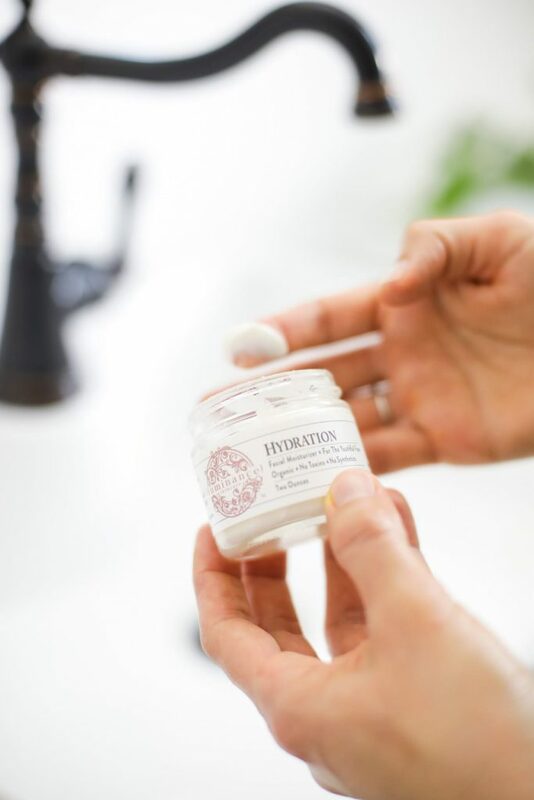 This moisturizer is lightweight and hydrating. I also love the Acure line of Day Cream and Night Cream (Target or Whole Foods). My goal is to exfoliate my face twice a week. Exfoliating helps my skin glow by sloughing off dead skin cells, and also improves the overall performance of other products used on my face. My favorite store-bought exfoliator is Acure Brilliantly Brightening Facial Scrub. My other go-to product is this homemade baking soda exfoliator. Honey, Aloe, Clay Mask: This is my go-to mask. It’s all the things I want in a facial mask. And I always have the ingredients in my pantry and bathroom closet. Spirulina Mask: I usually combine spirulina powder (found in the herb section at health food stores, or purchased online–also great in smoothies) with honey and aloe. I love the brightening power of this mask. Yogurt and Honey: Clearly I have a thing for honey in face masks, and for good reason. Honey can help hydrate the skin, and it offers antibacterial properties. Plain yogurt is a probiotic-rich food, and probiotics are a tremendous way to boost any skincare routine. Plus, yogurt is rich in lactic acid (alpha hydroxy acids), which is a powerful ingredient used to combat acne and signs of aging. I live in Florida, the sun capital of the world. For this reason, I use a sunscreen every single day. I haven’t always used sunscreen on my face, which is very evident by the darker spots speckled across my forehead. Live and learn to do better. My favorite sunscreen (for the face) is from Luminance Skincare. Since turning 30 a few years ago (and taking the pledge to take care of myself), I’ve been taking my skincare routine very seriously. I’ve also been working on adding or taking away products based on my skin’s current needs. I just recently ordered two new products to complement my skincare routine. Here are two new products I’ve added to my skincare routine. Mahina Evening Replenishing Elixir from Leahlani Skincare: I’ve been using this serum for over a month and love it. I plan to continue using this serum at night, after toner and before my moisturizer. Jade Roller: I started using a jade roller at night after applying the Mahina Elixir (mentioned above). After a month of using this tool, I’m in love. It’s helped to improve the overall condition of my skin and bring down inflammation or puffiness, including a giant pimple that appeared a few weeks ago on my cheek. I’ve read that a jade roller also helps to improve the performance of serums. I purchased my roller from a local store. There are a lot of options on Amazon, just check the reviews before purchasing. Morning: Upon waking, splash face with water. Apply moisturizer and sunscreen oil. Apply makeup, if wearing. You can peek inside my makeup bag over here. Evening: Before bed, remove makeup (if wearing), wash face with cleanser, apply toner with pad, apply elixir/serum, use jade roller, and apply a moisturizer. Extras: Twice a week I apply a mask or exfoliate after cleansing my face in the evening and then follow-up with the remaining steps in my skincare routine. Hey Maryjane, I’m so glad the post was helpful for you. Definitely, it’s so nice to have options! 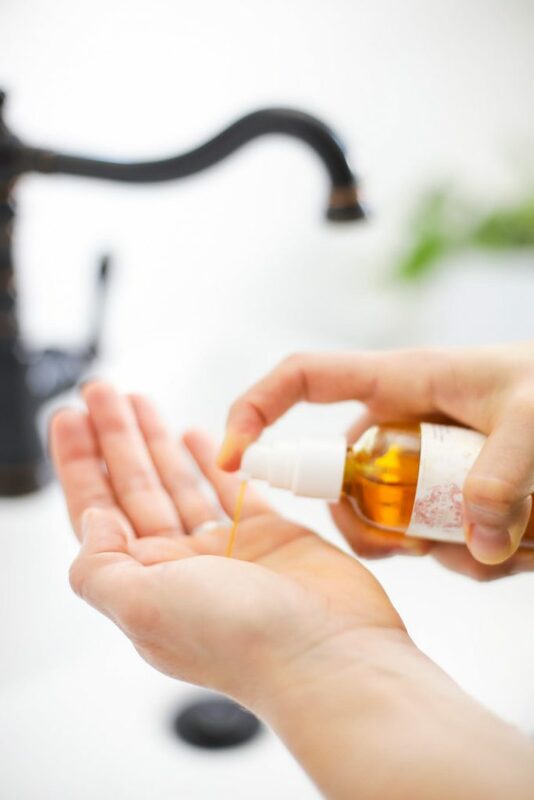 I am always read your books here you have shared the blog about daily skincare routine products tell me one thing my skin is oily can I use this or not. I love Lola Jane skincare products. They are very simple and natural. I use the whole line and my skin is so calm and healthy. I found the company when they were at spring at the silos in Waco. I figured if Joanna recommended them. They must be good! Didn’t disappoint. I find the products each last for 4-5 months too which is a plus. She also has quite a few sales. Awesome, Ashley! Her products look fantastic. Thank you for sharing. Hello Kristin I am Indian but lived in Australia. My wife always follow your skin tips. I specially commandeered your blog. I don’t have acne but I’m interested in anti~aging cleansers. I am really impressed with the milky cleanser ingredients you listed. I’m looking at my stash in pantry and wondering if the following mix would make a good diy milk cleanser…or if I shouldn’t mix certain ones. If I make a 4 oz bottle each week and refrigerate it to make it last do you think that would work? I’m not sure about amounts but I’d rather lean heavier on the coconut milk and oils and less on the castile soap. Thoughts on shelf life in and out of fridge? Hey Michelle, You could try something like this: https://livesimply.me/2013/07/14/homemade-body-wash/ But you’ll want to keep it in the fridge and use it within a week.